We are all chasing the American dream, but your story doesn’t have to start in the land of the free. Job competition in the United States is fierce. Whether you’re in small town USA or the nation’s capital, finding your dream job can be tricky. For every role you go for, another hundred, or even thousand, people could also be handing the recruiter their CV. To land that elusive, life-fulfilling job takes more than a bit of luck and wishful thinking. Standing out from the crowd is more important than ever. If you want to hit the big time, you need to show that you’ve got something that recruiters aren’t going to find elsewhere. With so many fine educational establishments churning out armies of highly intelligent and skilled workers, you’ll need more than a fancy degree to impress most city-going employers. Don’t expect internships to answer your prayers either, the competition for many placements is just as tough as getting into full-time work. Thankfully, there are still ways to improve your viability as a stand-out candidate, and none of these ways are better than working abroad. Not only does relocating and working abroad – long or short term, offer unique experiences that will make your candidacy pop, but it also opens the door to a number of personal benefits that go beyond building your career. Whilst your fellow candidates are going back to school, scrubbing plates or taking basic, low-paid work to get their foot in the door, discover how working abroad can blow your windows of opportunity wide open. If you were born, raised, educated and trained in New York City, you don’t exactly stand out from the millions of other applicants with the same experience. Out in Japan, or anywhere else in the world however, this skillset is very different from the hordes of other local workers, potentially making you a desirable candidate. By moving where your skills are rare, you have the potential for faster career advancement. Standing out from other applicants allows you to rise through the ranks quicker, or even enter the job at a more senior level, gaining high-level responsibility and experience early in your career. Confidence is the key to business success. It displays your competency and self-belief, inspiring confidence in others who seek to hire you or do business with you. However, confidence is not so easily acquired. Working abroad is the ultimate experience for gaining professional confidence, as it offers a unique learning process beyond anything like what you find back home. Out of your comfort zone, in a different culture, surrounded by strange faces, you rely more than ever on your own skills and ingenuity. The journey will likely be tough at times, but once you come out the other side, you’ll be bursting with self-belief. If you can succeed in an international city, away from all you’ve ever known, then you can succeed anywhere. Building contacts is a vital part of landing your dream job. People are more likely to help out the people they know, offering opportunities, partnerships and even work. This is why networking is a key part of the work environment around the world — it doesn’t matter if you’re in England or Argentina, making links is an important part of being professionally successful. Links can be the catalyst that propels you into your dream job, so the more you have, the better your chances of going further in your career. By spending time working abroad, you can create a list of international contacts, which can be combined with the contacts you have back home to create a global network, brimming with potential work opportunities. It is also worth noting that a global network of contacts may be invaluable to some employers, and is something that could give your CV the extra wow-factor it needs to land on the desk of the higher-ups. Every country in the world has a unique way of doing business. Business deals in America are often very pragmatic and efficient. The pitching process can be tough, business owners can be harsh but, at the end of the day, everything is taken care of quickly. In China, however, things are very different. Business deals often require good, sturdy relationships, building partnerships or making sales through slow-burn projects. When you spend time working in a city, you start to learn the way it ebbs and flows. You become privy to the cultures and customs of getting business done — first-hand experience that can’t be taught or learned from any book. This international workplace knowledge is a rare skill, perfect for the CV. It not only shows you adaptive and persistent, but it also displays an expertise highly desirable in multinational companies. Businesses that operate internationally are likely to view your skills as invaluable, as you not only understand the working culture overseas, but also the culture of the company you’re applying for. 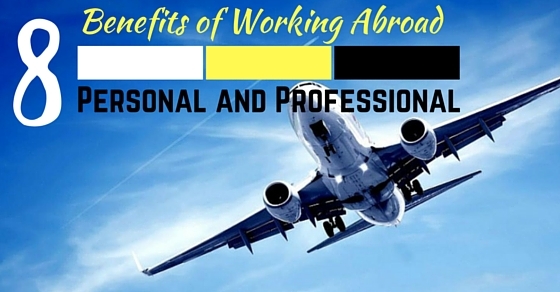 The benefits of working abroad stretch way beyond advancing your employability. International relocation also offers an array of unique, personal experiences that range from ticking off bucket list goals to changing the very way you see the world around you. The desire to travel is an intrinsic part of human nature. Many of us yearn to see the world and discover distant, far-off lands. The issue is that for many, traveling is not conducive to improved career prospects. What it does is take time and energy out of chasing your dream job. Working abroad, however, allows you to find and follow your career dreams while still exploring a new corner of the globe, immersing yourself in unique cultures and experiences. In our day-to-day lives, we are often bogged down in routine and familiarity. We rarely get a chance to explore and learn who we are beyond the only life we already know. Heading out into the world and removing yourself from your current situation places you in the perfect position to discover more about who you are as a person — find out what you are really made of. Just like going off to college, famously a place for learning about who you are, working abroad also takes you out of your comfort zone, surrounds with new people and a new lifestyle, allowing you to learn more about what makes you, you. Not every relationship that changes your life has the be professional. Moving and working abroad allows you to gorge yourself in a sea of new faces, meeting people you never would, or could have before. They say variety is the spice of life, and that is certainly true when it comes to people. Meeting and building relationships with people from other countries and cultures opens doors to experiences and adventures you’d probably never have thought before, potentially changing your life forever. There could be a million reasons you want to make a change and escape your current situation, and working abroad offers the perfect way for you to do just that — all while lining yourself up for future career moves. Making small changes like moving out or changing your job can only go so far, but by moving abroad you place yourself in a totally new environment, allowing for a completely fresh start. Author Bio: Heather Darby is the marketing manager for Gerson Relocation who are experts in global relocation.